The new World of Warcraft community site is live! Months in the making, this site will soon become the prime gathering spot for the community. We're very excited to finally open the doors and invite you into our new home. You can read more about the transition from our existing website to the new one in our original announcement. As we're considering this a live preview, we want your feedback about the look and feel of the new digs. Head to the community site, check out the new forum categories, and follow the Website Feedback links to let your voice be heard. Go ahead. Check it out! We have some tasty leftovers from our community comic contest to share. This comic was submitted by Bludlemon. Check out the full gallery here. Looking for the perfect holiday gift? Or perhaps you need a not-so-subtle way to show your World of Warcraft enthusiasm at the office (since shouting "For the Horde!" at the top of your lungs during meetings doesn't always go over too well)? Taverncraft has the solution with today's debut of two new massive stoneware mugs. One mug is devoted to the Horde, featuring a panoramic image of Orgrimmar, with the other showcasing the Alliance stronghold Stormwind. Each full-color mug holds a hefty 18 oz. (.53 ltrs.) of your favorite hot or cold beverage, and costs $19.99 plus shipping/handling. The mugs are available now at www.wowsteins.com, with guaranteed holiday delivery within the contiguous United States, while supplies last, if ordered prior to December 15, 2010. More Google News CGFR: Feed contains invalid format. News supplied by WorldOfWarcraft.com and Google News. 11 April 2012 - Noblegarden Guide updated! Well, we’ve been resurrected and are finding our way around the universe again. Our first task was to update our Noblegarden guide which required us to do a bit of egg farming! One of our Horde brethren was kind enough to submit a screen shot of the new mount. We were hoping for a giant bunny or chick, not a plucked chicken! Oh well. Happy seeking! 21 June 2011 - Midsummer Arrives! Ahune has been updated to L85+ and now drops item level 353 cloaks. The Frostscythe has also been updated to 353. Bonfire locations have been moved around due to the Cataclysm. At least this year, they were reset as of the start of the event! The companion has not been changed, so if you’ve been craving the little ice elemental, make sure you queue for Ahune each day! The Orgrimmar flame has been moved to the bluffs north of the Valley of Wisdom (next to the Tol Barad portal). Stealers should fly in from Azshara. The Darnassus flame has been moved to the Warrior’s Terrace on the east side of the city. It’s time once again to celebrate Children’s Week, with the chance to earn the affection of a young orphan, do a bit of charity work, and get your hands on a bunch of team reputation and a pet! 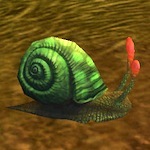 This year, the Orgrimmar/Stormwind Orphan Matrons have added a new pet, Scooter the Snail. Due to the Cataclysm’s destruction of most of the original tour sites (and the death of Cairne Bloodhoof who used to end the Horde questline), the Azerothian questline has been completely revamped. The Dalaran and Outlands quests appear untouched. As usual, we’ve updated our seasonal coverage which can be found here. 6 February 2011 - Love is in the Air Again! The Love is in the Air seasonal event started this morning. We’ve already updated our seasonal page (although we haven’t yet verified the coordinates of the Crown Chemical Wagons, but the general locations don’t appear to have changed). The only major upgrade is that Hummel and his cronies are now L87 elites, and the neckpieces Hummel drops are item level 346. You may queue for the Hummel encounter at L84 by talking to the Inspector (Detective, for our Horde brethren); you may have to complete the Inspector’s quest chain first. The first encounter of the day will also yield a Heart-Shaped Box which contains 24 Justice Points and the chance at seasonal items. Enjoy the luck of the season! The explorer’s committee has updated the locations of the the Elders. The hardest one to find was the Elder in Stormwind, since the quest pointer and text currently both point to the Park – and the Park was destroyed by Deathwing. 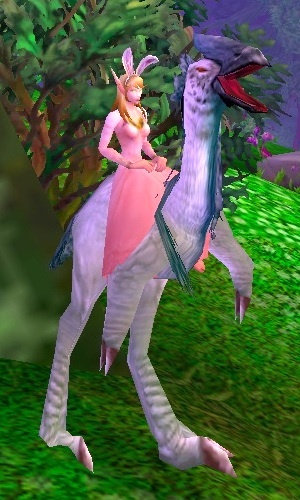 The Elder and Lunar Festival NPCs for Stormwind have moved outside the city gates in Elwynn Forest (34.6, 50.3). This new location is pretty much unguarded, so the Horde finally have an easy capital city “flag” to get. We will continue to update the seasonal guide as we find new content. Enjoy! 23 January 2011 - Happy Lunar New Year! The Lunar Festival has started. No major changes have been observed so far this year, although some of the Elders have moved slightly to accommodate the changes in geography wrought by a certain cranky death-dragon. We’re updating our Elder list and the seasonal page (found here). Enjoy! The wonderful season of WInter Veil is once again upon us. In the midst of all the changes for Cataclysm, the old traditions still have the power to entertain us. Translated, that means that there are no significant changes to the festival this year. We will be tweaking our seasonal guide, of course. Best wishes of the season to all! 7 December 2010 - The Cataclysm Is Here! Well, at this point, almost here – thinking about leaving for a midnight launch at the local Best Buy. We’ll be feverishly updating our pages over the next couple of weeks; the Shattering changed a lot of the world, and Cata will unlock more secrets. For those who are preparing, remember that the trainers will Illustrious Grand Master you upon the midnight (PST) reset, and that Archaeology will become available (trainers are in Stormwind Library, Grommash Hold, and the Legerdemain Lounge in Dalaran). As soon as midnight clicks over, assuming you have your Cata key registered, you should gain access to the new content (also assuming you’ve been downloading the patches and haven’t just come in to this cold). Five minutes before an attack, Earthen Ring NPCs will call out a warning. L80 characters can help by placing Sandbags or Barricades around the town to protect townsfolk. Talk to an Earthen Ring Defender to get your Earthen Ring Unbinding Totem. The Elementals will trap NPCs in every district of the city; you must find them and use the Totem to free them. Rifts will spawn in multiple districts. Each will spawn 32 Elementals which must be defeated to close the rift. Closing the rift results in a buff dependent on the type of Elementals defeated. Closing one rift of each type (usually requiring defending each city twice) will result in gaining the “Tripping the Rifts” achievement (if you haven’t already gotten this in the earlier phase). Successfully defending a city by closing all rifts will open a rift to the hideout of an elemental lord, allowing players to queue for a boss encounter. All bosses drop a variety of Epic (item level 251) loot, approximately equal to Frost Emblem or ICC 10 gear. WowHead has a nice listing of the drops from the four different bosses here.